Size: 4.7" x 2.6" x 0.4"
This perfectly designed TI-2900 Info Bank stores 125 names and numbers in a 2k Byte memory. In addition you an alarm clock with up to 10 alarms, an useful calculator with 10 digits capability and a code protected area for secret informations. A big advantage of the Info Bank is the protection flap over the keyboard. Even if the flap is closed, two keys allow the access to the names and numbers stored in the memory. The display of the Info Bank consists of one line for alphanumeric characters and one line supporting only numbers. The TI-3400 Europa Databank introduced the same specifications in a desktop housing. 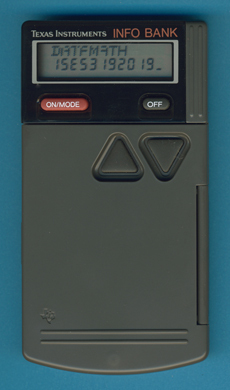 About one year later the PS-2100 packaged the same specifications in a credit card sized housing. Dismantling this TI-2900 Info Bank manufactured in October 1990 by Inventec Corporation in Taiwan reveals a surprise! The complete electronics of this highly versatile gadget of the 90s is based on a Toshiba T9810H Application Specific CPU and just few additional components. The Toshiba T9810H chip is known from the TI-3100 Pocket Dialer. Manufacturing of the TI-2900 Info Bank was shifted in or around 1991 to a Inventec Corporation manufacturing site in Malaysia. The Info Bank roots back to the TI-2700 Mini Data Bank introduced in the year 1987 and uses similar hardware to the TI-3100 Pocket Dialer. Texas Instruments launched in 1987 a very innovative product line with the TI-2400 Phone Bank, TI-2600 Personal Banker, TI-2700 Mini Data Bank, and TI-2800 Paperless Printer followed till 1990 with the TI-2100 Pocket Info, TI-2900 Info Bank, TI-3100 Pocket Dialer, TI-3200 Pro Dialer, and TI-3400 Europa. If you know the history of Texas Instruments it seems to commemorate the introduction of the TI-2500 Datamath a quarter century ago.